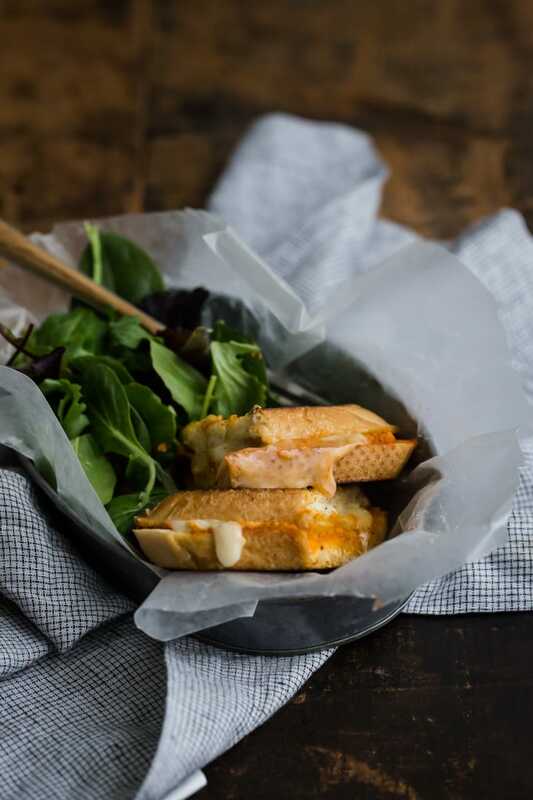 Romesco and Hummus Grilled Cheese | Naturally. Let’s say hypothetically that you saw the romesco potatoes the other day and thought, “oh yeah, I’m going to make those.” You headed to the kitchen, whiped them up, devoured said potatoes, and then realized you’re left with some extra romesco sauce. The logical next step? 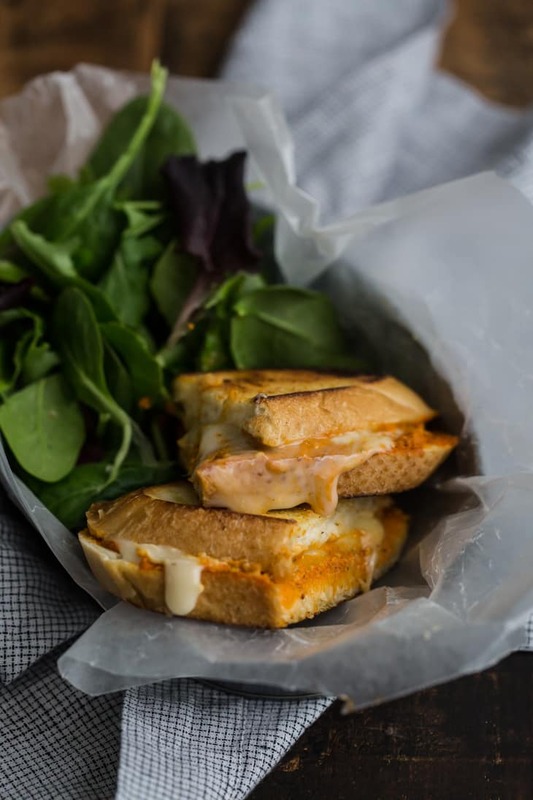 Save it to make this grilled cheese sandwich. One of my favorite things to do is make extra of a sauce and use it for multiple recipes. I’ve done this with my favorite harissa recipe (and in fact made two different types of grilled cheese (here and here) as well as smothered some quinoa patties with it.) One of my other favorites is this spicy masala sauce which I then used to make a must-make potato skillet. I love being having one flavorful showstopper and use it throughout different meals throughout the week. Beyond the sauce, this grilled cheese has one of my other favorite additions: hummus. I think it’s rare that I make a grilled cheese without a nice smother of it. And if you’re like me and into the hummus on the sandwich, I highly recommend you make this groovy bagel melt. Preheat griddle over low heat. Brush the outsides of the bread with olive oil. On one piece of bread, spread 2 to 3 tablespoon of hummus. Layer with 1 ounce of taleggio cheese and 1/2 to 1 ounce of mozzarella. 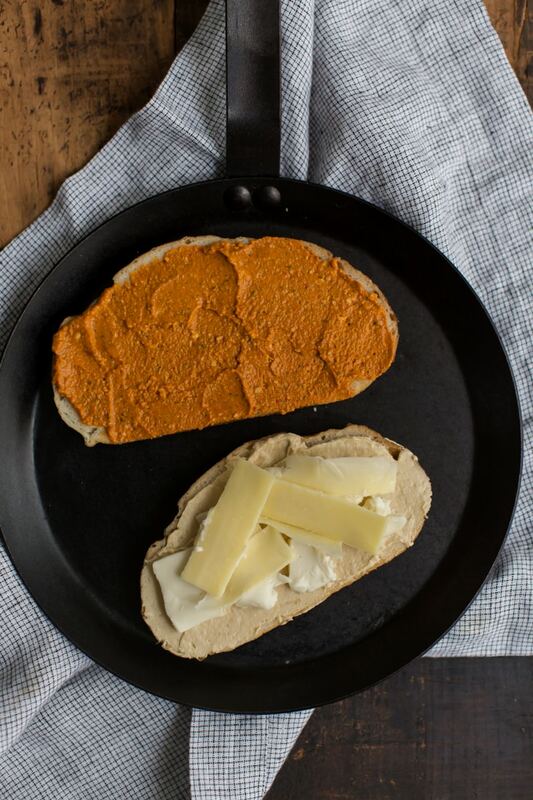 Spread 2 to 3 tablespoon of the romesco sauce on the other slice of bread and place over cheese. Grill on each side until browning and cheese is melting, 3 to 5 minutes per side. Repeat for second sandwich. 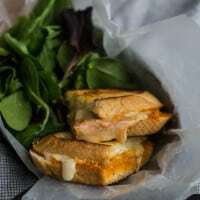 If you can’t find taleggio, use fresh mozzarella and sub in another flavor cheese like gouda. This has inspired me to try the edamame hummus in my fridge on a grill cheese. Perfect weekend sandwich! Loving the hummus+romesco mix! Now this is a grilled cheese I would love. Always enjoy your unique, creative flavor combinations, and I’m putting this on my list to make soon! I always load my sandwiches with humus but never thought to put it on a grilled cheese sandwich. Giving that a try next time. I must have this cheesy deliciousness! This grilled cheese sounds so good! Having leftover bits and bobs to use us is such a challenge sometimes — this is a perfect solution. Hummus grilled cheese is my latest obsession, love the romesco twist! I’m super intrigued by this. I love grilled cheese (all forms) but grilled cheese with other things is the absolute best! I adore the gooey, warm, cheesy, crunchy, deliciousness. I also am a HUGE hummus lover so this has my name written all over it. I’m picturing this with brie and ham and maybe even some sort of green? Can’t wait to try it out. I love the twist you’ve done on the classic. I’m going to try this the next time I make grilled cheese.